Tourism NI’s Quality Grading Scheme for premises offering tourist accommodation is designed to give visitors a clear idea of the standards of hospitality, service, cleanliness and comfort that they can expect during their stay. The Greene House is a newly built property with three bedrooms, furnished in a contemporary style with modern conveniences. Located in a tranquil setting on the Foyle estuary with access to the Lough Foyle Trail, and commanding amazing views towards Donegal and the Binevenagh Area of Outstanding Natural Beauty, this comfortable and spacious property offers an ideal getaway for lovers of the outdoors. This cosy home away from home is also perfect for those wanting to explore the beautiful, rugged North Coast and the historic walled city of Derry~Londonderry. 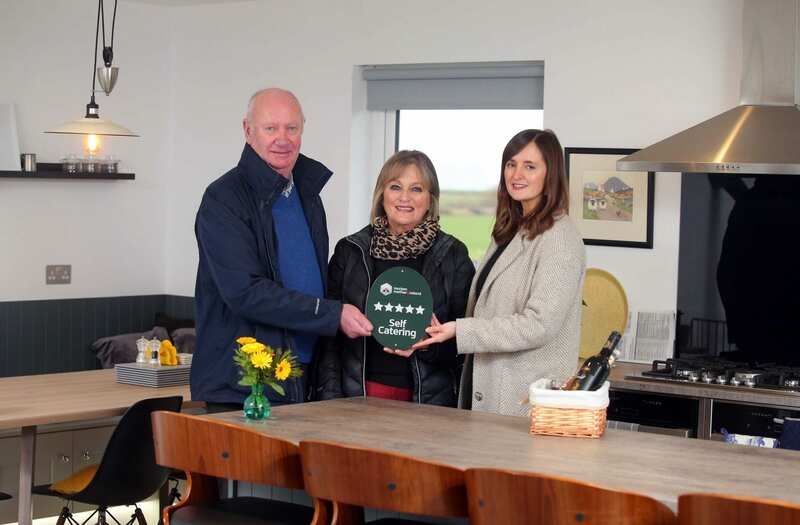 “I commend Ronnie and Arlene for the time and effort they have taken to create such a high standard of visitor accommodation in the area and wish them every success with their new venture”.